Born in Arrecites, Argentina, in 1922, González became known to British fans as The Pampas Bull but to his friends (only) he was El Cabezón (Fat Head). Considering his physique Pepe (to his family) was a good athlete, and started racing on two wheels. He arrived in F1 in 1950, driving a Maserati 4CLT/48 for Scuderia Achille Varzi, at Monaco (where he qualified 3rd, behind the all-conquering Alfas of Fangio and Farina), and also in France, but retired from both races. In 1951 he entered his own Talbot-Lago T26C-GS in the Swiss GP, and again retired but, half way through the season he was given a seat with Ferrari and finished on the podium in the last five races, to take 3rd place in the Championship, just 1pt. behind Alberto Ascari, who was 6pts. behind Fangio. A truly phenomenal performance. In his first eight GP races González retired from the first three, and was placed 2nd(shared), 1st, 3rd, 2nd, & 2nd in the other five. He was also on pole (1sec. ahead of Fangio) at the 1951 British GP and his win there (almost 1min. ahead of Fangio) was the first for a Ferrari in a World Championship event… and also their first pole. In Germany González again qualified ahead of Fangio (who went on to win his first Championship) but was just pipped by him in the race… both being beaten by Ascari..
As a side-note the Alfa Romeos in this race were using fuel at the rate of about 530m./L (1.88L/kilometre). How does this compare to 2014 regulations? During the year, 47 entrants provided 24 different makes of car (from AFM to Veritas) for 72 drivers (Abecassis to Wharton) of whom 16 scored Championship points. Ascari won six of the seven races, having missed the opening Swiss GP while becoming the first F1 driver to qualify for the Indy-500 – although other European drivers had done so before WWII. Ferrari won all seven races. Having lost his Alfa Romeo seat, Fangio drove a BRM in two non-championship races, and a Maserati at Monza, where he crashed badly and was lucky not to be killed. If he had been, he probably would not now be known as the greatest driver of the post-War era. Meanwhile Ferrari quickly picked up Farina from Alfa Romeo, which left González without a drive. Of the top four drivers of 1951/52, two were now teammates at Ferrari, and the other two were on a kind of gardening leave, in Argentina. At the final event of the season Maserati arrived at Monza with three A6GCM cars (the forerunner of the most famous, and arguably most beautiful F1 car, the 250F), for a couple of Italian guys, and… González who, first time out, qualified 5th, just two seconds behind Ascari, but took the lead at the start, and held it almost to the halfway point when a lengthy pitstop dropped him to third… but he fought back and finished second. He perhaps couldn’t have expected to beat Ascari this year but they nevertheless shared the fastest lap. This year continued under F2 regulations and was another Ascari (5 wins out of 8 races) / Ferrari (7 wins) whitewash. Maserati retained González and Felice Bonetto, and also signed up Fangio, but their cars, though fast, initially lacked reliability. In the first five races González had three podiums, and a 4th – Fangio had two podiums – but, after the British GP, González received back injuries from a crash in a sports car race in Lisbon, and returned home to recuperate. F1 politics during the 50’s seems now, at such a distance, to be shrouded in mystique and uncertainty. Driver movements between teams was like a flock of bees in a flower-garden, but without gardening leave. Loyalties between teams and drivers seems to have sometimes been little better than turncoats in a Civil War. Double Champion (1952/53) Ascari left Ferrari, after a salary dispute, and joined the new Lancia team but, as they were very late appearing, he also had two drives for Maserati, and even one for Ferrari, before Lancia arrived for the final race at Monza, where Ascari set pole position, and fastest lap, and led the race, before retiring. The 1950 Champion, Farina, was joined at Ferrari by González, while Luigi Villoresi also signed for Lancia, but occasionally joined 1951 Champion, Fangio, at Maserati, but Farina was now on a downward slope, despite putting his Ferrari on pole, and finishing second, in the first race. Farina still holds the record for the oldest driver (48) to take pole. I feel sure this is one that even Vettel won’t take. Then a sort of bomb-shell hit F1, at the sudden (re)appearance of the silver, three-pointed star of mighty Mercedes, after a fifteen-year gap. At the third race, in France, the unforgotten, and still imposing figure of Alfred Neubauer manifested in the pitlane, along with three gleaming W196 machines that seemed to transcend the term ‘car’. After two races, and two victories with Maserati, Fangio was (presumably – but when exactly…) made an offer he couldn’t refuse, and jumped ship, and put his ‘silver arrow’ on pole, ahead of new teammate, Karl Kling… and that’s how they finished, a tenth of a second apart, and a lap ahead of the field, while the third car of Hans Herrmann recorded fastest lap (on the 3rd lap) before his engine embarrasingly gave up. González had started on the second row but nobody could touch the cars from Stuttgart. At Silverstone nobody waited with baited breath to see if Mercedes would take pole, and Fangio duly obliged. However… González put his Ferrari right alongside and dashed ahead as the flag fell, and held the lead to the end… with teammate, Mike Hawthorn, one minute back, in second – in effect, the Silver was quickly tarnished – but it was only temporary. The race entered the record books because Ascari’s fastest lap was equalled by Jean Behra, Fangio, González, Hawthorn, Onofre Marimón, and Moss. As the fastest lap at that time received one point towards the Championship each of these drivers added 1/7th of a point to their overal scores. Remembering that drivers also sometimes shared a car, and any points won, González arrived in Britain with 6 1⁄2 pts, and went away with 14 9/14 pts. At this point in the Championship chase Fangio led, with 28 1/7. with González second, on 14 9/14. To lose a Championship by just one point must be galling but to lose by 1/14th… How would you explain that, back home…? At the Nurburgring Fangio was again on pole but Herrmann could only manage 4th, while Kling was back in 23rd, and ‘new-boy’, Hermann Lang (who had actually been a star of the pre-war Mercedes team) claimed 13th. Hawthorn and Moss upheld British (and Italian) honour, qualifying 2nd & 3rd for Ferrari/Maserati, but both retired within a couple of laps. González was 4th. Maserati lead driver, Marimón, crashed and was killed in practice and fellow Argentinian, González was so distraught he was quickly called in during the race, to hand his car to Hawthorn, who went on to place 2nd, behind Fangio. It should also be remembered that, back when men were men, and boys didn’t often take part [or, as Garrison Keillor asserted, “…when all the women were strong, all the men good-looking, and all the children above average…”], GP races were around 500km. in length, and this German GP lasted 3hrs. 45m.. the longest in F1 history until the chaotic 2011 Canadian GP, which had a 2hr. tea-break in the middle. Thence to Switzerland where a recovered González claimed another pole, ahead of Fangio – the now legendary, supposedly ‘all-conquering’, Mercedes team actually only qualified 2nd, 5th & 7th, and finished 1st, & 3rd, with one retirement. Only González finished the full distance (and took fastest lap) behind Fangio, who wrapped up the Championship, without us having to worry about 1/14’s of a point. least dominated-by-Mercedes races of the year. Kling started from 4th to lead the first few laps, until Fangio took over for a couple, but a very fast-charging Ascari soon passed them both and held the lead for 41 laps – apart from one, when Fangio managed to get his ultra-streamlined nose past the Ferrari, and one where Moss led a GP for the first time. 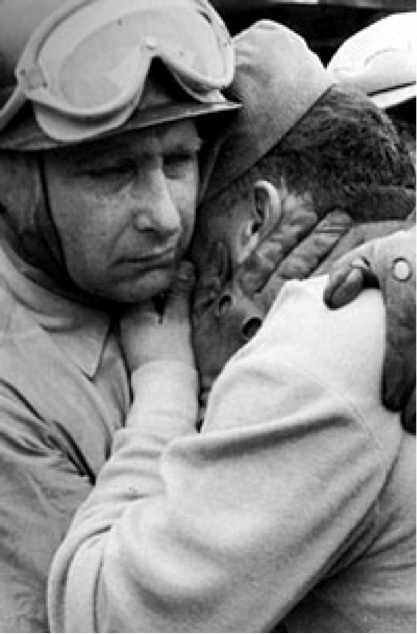 When Ascari’s engine cried, “Enough, already…!” Moss took over, for a further 19 laps, until his Maserati also started coughing, and Fangio took over to the end. González had lost his gearbox early on, and took over Umberto Maglioli’s car, which he brought home in 3rd, behind Hawthorn, recording another fastest lap in the process, after which González had another bad crash. while practising for the Tourist Trophy in Northern Ireland, suffering severe back injuries and returned home… and Maserati arrived in Spain with Spaniard, Paco Godia, taking The Bull’s seat, after just one previous appearance in F1, back in 1951. I expect this was a ‘paid’ drive… Godia returned to F1 for 1956-58, scoring two fourth places from twelve races. Better news came with the much-awaited arrival of the Lancia D50’s for Villoresi and Ascari who, right out of the box, qualified on pole, before both cars emulated an RB10, and retired early. 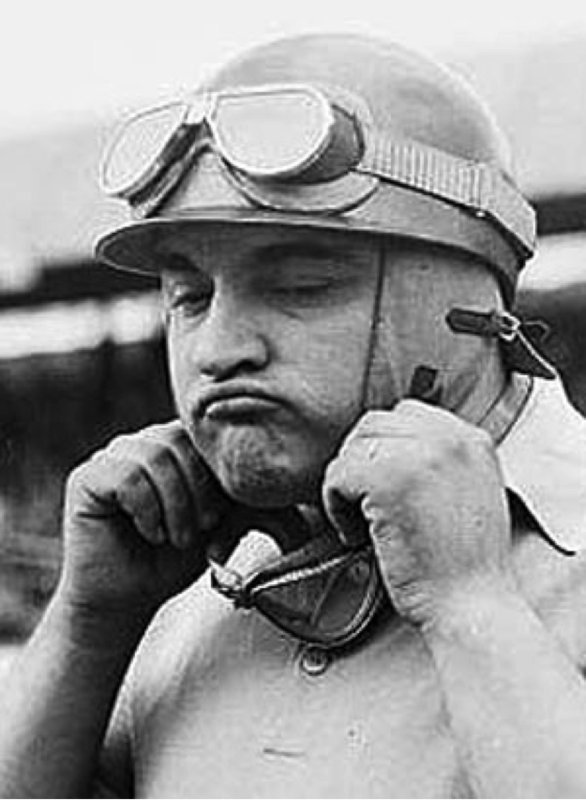 Fangio also had engine problems and finished 3rd, a lap down. Maserati filled eight of the first eleven finishing slots, but Hawthorn took Ferrari to victory, and 3rd place in the Championship, while the absent González held onto 2nd, with one win, two 2nd, two 3rd, and one 4th places. This year González shared a Ferrari with Maurice Trintignant to win the 24hrs. du Mans… at his fourth attempt, leading for 17 of the 24 hours. Over the winter it seems just everybody who was anybody was courting the ‘Seats at Stuttgart’. Neubauer retained Fangio, Kling and Herrman but also considered several drivers from Ferrari and Maserati, along with numerous talented privateers. Fangio apparently put in a good word for his friends, Gonzalez at Ferrari, and newcomer, ex- mechanic, and rising star, ‘Rafi’, at Maserati, but the decision went to ‘whiz-kid’ Moss who subsequently, and famously, followed Fangio into the record-books. For the first race, in Argentina, Maserati arrived with seven cars – the new 250F – and Ferrari joined the onslaught with four cars, led by Gonzalez, along with three D50’s from Lancia. Equipe Gordini was still running, but not for much longer. First blood went to Gonzalez who claimed pole, ahead of Ascari and Fangio but, in a sheer race of attrition, 14 of the 21 cars retired and, in the severe heat, many drivers were simply unable to continue. As a result there were sixteen driver changes throughout the race, many drivers even piloting three cars. Kling had crashed on the second lap and took over Herrmann’s car, until Moss’ car also failed and he took over Herrmann’s car from Kling. In the Maserati camp Behra, who had been involved in the Kling accident, took over Mantovani’s car, while Musso handed his car to Mantovani, who later passed it on to Schell, after he had given his car to Behra, who had previously handed over to Musso. In the meantime, Schell had inherited Bucci’s car, which he now passed on to Menditeguy. Not to be outdone, after Villoresi’s D50 sprung a fuel leak, Lancia put him in Castellotti’s car but, when Ascari crashed, they allowed him to retire. I hope that makes sense… And today, commentators become confused when cars just change tyres…! Gonzalez accepted his 2pts. (one-third of the six for 2nd place) and wasn’t seen again for the rest of the season. And that was the sad, unexpected and unannounced end of the incredible career of José Froilán González… who seemed to come from nowhere, when he was introduced by his friend, Fangio, to European racing, which he instantly took by storm. Gonzalez seemed able to take a car and just wring it’s neck, in a manner reminiscent of the Great Nuvolari. It is also said he could turn the steering-wheel as if about to tear it off the column. At the end of his first win Gonzalez took the flag while waving his helmet and goggles in the air – no pansy donuts for this boy! Even when you average his results over the 26 races of his inconsistent nine years in F1 he still scores more than twice as many points than all but five of the other drivers below him on this list, and thus comprehensively deserves his second place here. Gonzalez’ two wins came against the might of Mercedes and Fangio (1954) and against the superiority of Alfa Romeo (1951) who had not been beaten since 1946. In 1956 Gonzalez had a one-off drive in his home GP, for Maserati, and was offered a drive by Vanwall in the British GP, but retired from both. It is perhaps disappointing that Gonzalez declined an invitation to join the Vanwall team but the death of his friend Marimón still distressed him. In 1957 Ferrari provided a Lancia-Ferrari for his home GP, which he shared with Alfonso de Portago, and came 5th – and that was virtually it – until, three years later, Ferrari gave him a nostalgic run in a Dino 246, in which he qualified 11th, and finished 10th… which was it. In his time Gonzalez was the youngest driver to start an F1 race (27), the youngest pole-sitter (28), the youngest to set fastest lap (29), the youngest to stand on the podium (28), and the youngest winner (28). Ferrari also now offered him a contract: 150,000 lire /month, the same as Ascari and Villoresi, plus 50% of the start-money. Gonzalez signed almost without looking. Gonzalez recalls: “With the Comendatore I always had an excellent relationship. He fought with the majority of the other drivers, but he was always good with me because I never argued. Some drivers had me angry for that. They always complained about something at meetings with him. They criticized his cars. Once, after hearing them all, Don Enzo asked: ‘Froilan, you have something to say?’, and I told him: ‘Commendatore, for me it is all good, no problem’. The others wanted to kill me! I remember that Alberto and Luigi went crazy”. 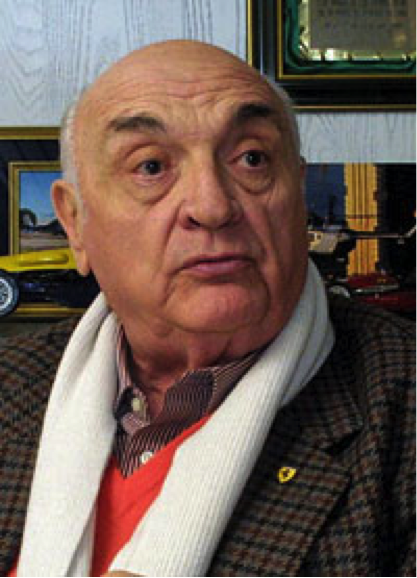 Froilán Gonzalez ran his car business in Argentina, made numerous appearances on TV chat shows all over the Spanish-speaking world, frequently appeared at Ferrari events and was one of very few drivers of his era to live long past his racing career, dying of respiratory failure in June, 2013, at the age of 90. In the following video clip Froilán remembers that first emotional victory. Gonzalez’s death leaves this writer’s mentor and hero, Jack Brabham, as the oldest surviving F1 race winner, at 88. French ROBERT MANZON Is The Last Driver Alive That Competed In The First Ever Year Of F1 – The 1950 Season. He Died 2 Days Ago. BIG BALLS BACK WHEN ! Sorry for doubting you Black Jack, I’ll certainly have this! Excellent stuff, a fascinating driver. I spent a long time when I was 15 painting a water colour of him in his old age as something about him intrigued me. In some ways like no other driver. Ater reading this I went to loof for said painting in the attic, and actually found it, and was thinking about it some more, and I think I must have actually been 17-8ish, because I think I drew it after reading something in one of the first few F1 racing magazines, which I subcribed to, and they started March 1996. Either way, I’m 35 now, so it was 17-18 years ago I think. Still not sure what drew me to his character. The reason I asked was because I was surprised that you could be so fascinated so many years afterwards – would be interesting to analyse, maybe. Thanks for sharing. 1. I hadn’t previously made a connection, but it seems to me now that Marko/Domenicali commenting about Mercedes’ development of the new PUs over the past year or two has shades of history repeating itself? 3. It’s funny how different eras (or for me, decades, specifically) have an influence in themselves on level of respect/admiration for people of the time… Me, I don’t like the 50s or 60s so much, and I would hold in higher regard any loser from the 70s! 4. Anyway, I’m very much looking forward to reading the Andrea de Cesaris article tomorrow. 4 – Ha, Ha, Ha, Ha, Ha, Ha, Ha, Ha, Ha, Ha, Ha, Ha, Ha, Ha…! Since you mentioned Ascari and Ferrari I thought I’d leave this here for you. Turns out there’s buckets of historical F1 videos on YouTube. Fantastic write up as always, BJF, I’m LOL’ing at the thought of the announcers trying to do Championship points in the 14ths. Thanks Matt – nice compilation. It is indeed astonishing just what YouTube has managed to acquire. Matt thank you for this. A superb look back. Very nice article! Thank you for this! Another fun way to look at this list is that we have 5 drivers from the Southern Hemisphere. Looking beyond the pride that each of us should feel for drivers of this quality originating from our individual geographies, what is cool is that the ratios of driver origins in this (admittedly subjective) list of very talented drivers reflects well why F1 can properly declare their championships to be World Championships. Love the first photo – reminds me of John Belushi. Wonderful piece BJF, you put a lot into there and am grateful to you. Can actually recall his competing from way back when F1 first got my interest. Interesting.. I had Gonzalez down as one of those who just missed the top 25! I knew Berger in 6th was ‘greyed out’ for spoiler reasons.. but even though I wrote the post, I still wondered if that meant Bruce McLaren was 2nd! The 50s are definitely the decade I know the least about.. but I did know that Gonzalez won Ferrari’s first F1 World Championship race. I thought his early retirement would count against him.. but what an interesting character! Learned a lot more about the 50’s and Gonzalez in general. I gave Bruce a lot of thought but, to be harsh, I felt he is remembered more today because of the continued existence of his team, and also because of his sad demise… but, as a driver, he might have done better if he hadn’t had the worries of founding his own team. Much the same might be said of Gurney, Fittipaldi, and Surtees, although the former did much better than the others – maybe it was just the personal make up of the individuals… Gurney proved his various talents in so many ways that the others didn’t quite manage. Most drivers who have formed their own teams tended to drive for just one or two more years before concentrating on running the team… perhaps my mentor was the only one who continued driving his own cars, for a further eight (8) years, and continued to be successful, as both a driver and a constructor. It must take a special kind of guy to do both, which is no aspersion on the others.